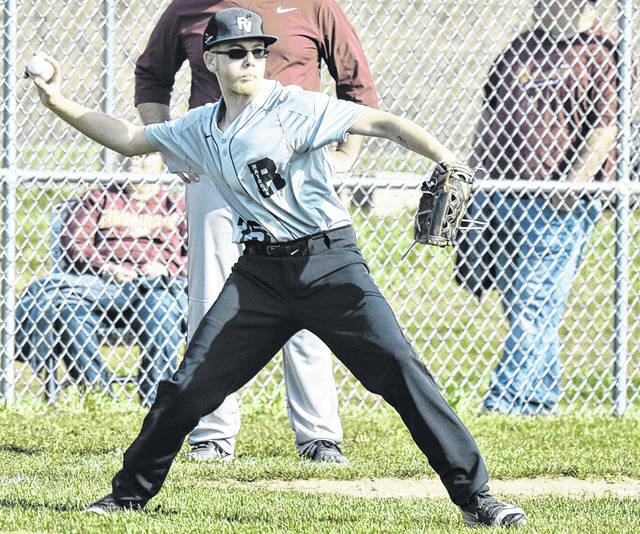 RVHS junior Wyatt Halfhill attempts a throw from third base during the Raiders 12-1 loss to Meigs on Wednesday night in Bidwell, Ohio. BIDWELL, Ohio — Plenty of runs and a clean defensive effort most often leads to victory. 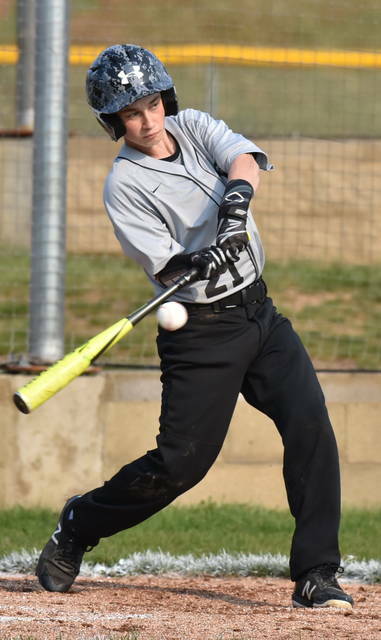 The Meigs baseball team surrendered one run on six hits and played error-free in the field en route to a 12-1 victory against Tri-Valley Conference Ohio Division foe River Valley on Wednesday night in Gallia County. The Maruaders (4-7, 4-2 TVC Ohio) charged to a 4-0 advantage in the top of the first, as a two-run home run by Zach Helton sparked the visitors to four runs on two hits in the inning. Cole Arnott, Zayne Wolfe, Brentten Young and Helton each scored runs in the frame, as River Valley (0-6, 0-5) committed two errors and two passed balls in the frame. The Maroon and Gold tacked on two additional runs in the top of the fourth, as two more errors by the Silver and Black allowed Wyatt Hoover and Arnott to score and extended Meigs’ lead to 6-0. The Marauders pushed their lead to 9-0 in the top of the fifth, as they manufactured three runs on one hit, two walks, two sacrifices and two River Valley fielding miscues. Meigs added three more runs in the sixth, as they sent nine hitters to the plate and extended their lead to 12-0 by way of four hits and one walk in the inning. The Raiders scored their only run of the contest in the bottom of the sixth, as Andrew Mershon led of with a walk and later scored when Jack Farley provided a one-out RBI single. Meigs retired the next two RVHS hitters in the order to close out the 11-run victory in six innings. Wolfe earned the pitching victory for the Maroon and Gold, as he provided four innings of work and allowed no runs on three hits, with one walk and three strikeouts. Wesley Smith appeared in one inning of relief for Meigs and surrendered no runs and one hit, while striking out one hitter. Cory Cox also provided one inning of relief and gave up one run, two hits, with one walk and one strikeout. Wesley Smith and Young led the way for the Marauders, as each finished with two hits apiece. Smith also scored three runs, while Young provided two runs in the win. Zayne Wolfe, Briar Wolfe, Cox and Helton each finished with one safety each to conclude the hit totals for Meigs. Briar Wolfe and Helton each provided two runs batted in, while Zayne Wolfe had one RBI. K.C. Collins and Alex Euton led River Valley with two hits apiece, while Will Edgar and Farley finished with one safety each. Farley provided the lone RBI for the Silver and Black in the contest. The Raiders committed eight errors in the contest, while the Marauders recorded no fielding miscues.